To pallet jack or to forklift…that is the question. It’s a common decision for small business who have material handling operations…will you lift pallets with a forklift or a pallet jack? Really, you need to calculate labor and truck costs before you decide. 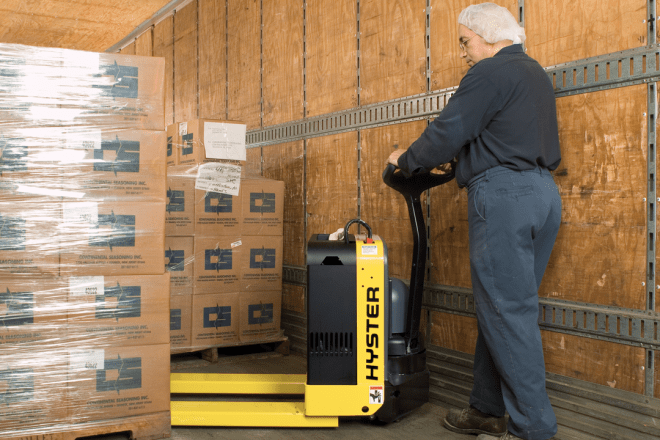 The Hyster HY55-PT-27, like many manual pallet jacks, is simple and straightforward. Operators position the forks under the pallet, pump the handle to raise the load high enough for ground clearance, then pull it to wherever they need. Limited space? Smaller loads? No problem - pallet jacks are compact and can lift up to 5500 pounds. Manual pallet jacks are great for businesses with limited space, loads under the max capacity limits, and facilities with ground storage (since the maximum lift height is under 10 inches). Remember, it is manual, so take into consideration speed of operation. For larger facilities, try an electric pallet truck , like the Yale MPE060-F . Electric pallet trucks offer power assist lifting and maneuvering; some even have a space for the operator to ride to help reduce operator fatigue and increase the number of pallets moved per hour. If you have pallet racking or need to stack pallets, a forklift is a must because pallet jacks can only move ground pallets. With a reach truck, like the Hyster N30ZDRS2 Double Reach , mast configurations allow operators to safely lift loads up to 35 feet. Forklifts typically have a much higher weighted load capacity than a pallet jack. If your pallet loads typically exceed 5,000 pounds, a forklift is best. Trying to move a load heavier than the max rated capacity is not only bad for your equipment, but it is dangerous and puts your employees at risk. You might choose a forklift over a pallet jack if you need to move a lot of pallets quickly. Forklifts offer greater speed and better handling than pallet jacks, which means a greater number of pallets can be moved per hour. WHICH IS THE BETTER CHOICE FOR A SMALL BUSINESS? The best choice for your business will depend on the number and weight of the pallets you move daily and your current storage arrangement. Based on those factors you can calculate which warehouse equipment is the most cost-effective for your needs. The lower upfront cost of a manual pallet jack might be tempting if you’re operating with a tight budget. However, keep in mind, your total cost per pallet moved could be lower with a forklift when you factor in labor costs and effect on productivity. Use the formula below to determine the total cost per pallet moved for each piece of warehouse equipment you are considering whether new, used, or leased. The cost per pallet moved will help you determine which piece of equipment will add the most value to your current operations. If you plan to expand or change your storage set up in the next year, it is a good idea to plan your equipment purchases using conservative projections. Our team at Papé Material Handling has been helping small business owners choose the best warehouse equipment for nearly 30 years and we’re pleased to help you meet your unique needs. Visit your nearest location in Washington, Oregon, California, Montana, or Nevada to learn about your options in new and used material handling equipment. These industry-leading manufacturers are changing the warehousing landscape. Automation, safety, and flexibility are key to combating the age of Amazon.